Paleo Girl's Kitchen: Busy Busy, so here are 4 recipies! Busy Busy, so here are 4 recipies! Since I only cook for myself, I am spoiled with only having to cook one or two recipes and they last all week. So, with my busy Christmas schedule, and cold I was fighting, I haven't posted in a while. Sorry! To make it up, I am posting 4 recipes. I spent most of last night cooking for the week so here is what I came up with. 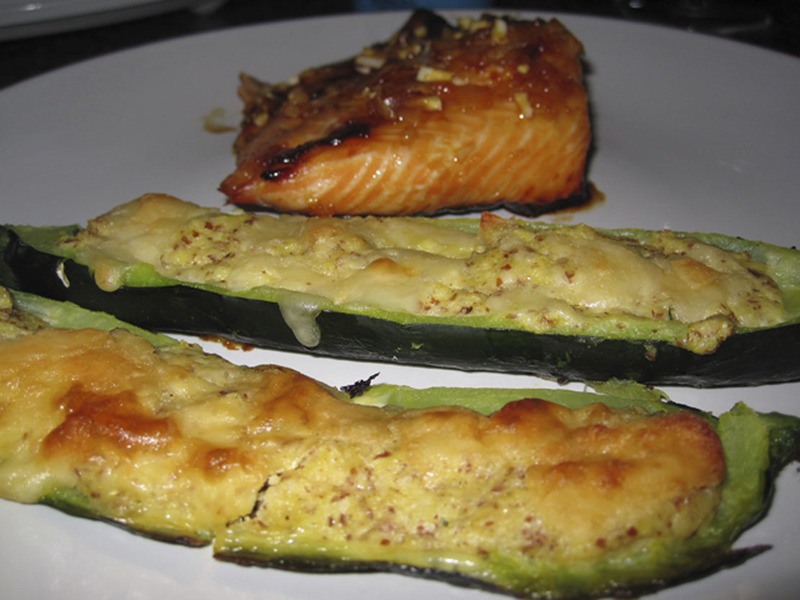 These aren't strict paleo :( The soup and guacamole are, but the fish and zucchini aren't. 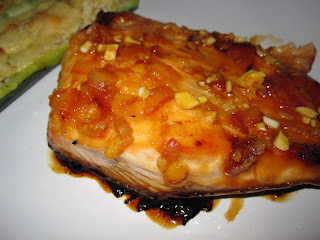 This is my favorite salmon recipe though, so if you can bear to eat a little sugar I would definitely try it! 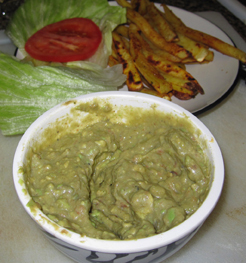 Directions : Mash up avocados and then combine with remaining ingredients! Eat on a burger, or use as a dip for just about anything! Directions: In a large soup pot saute sausage, garlic and onion. Once browned, add in broth, tomatoes and carrots. Simmer for 15 minutes. Add remaining ingredients and simmer 5 minutes. Serve Immediately. I made this for lunch this week. It was quick, easy and tasty. Great reheated as well! Also two great finds! I always use Chico bags for groceries and packing lunch! 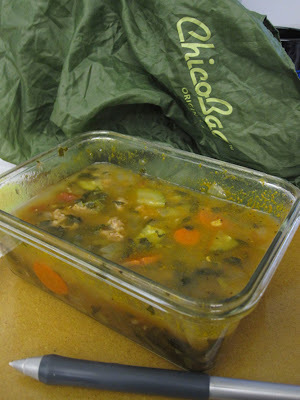 Also, I got glass tuperware from costco, it is safer for reheating and storing food! Directions:Poke zucchini with fork. Boil for 5-12 minutes until soft and easily can poke with fork. Drain and let cool. Half the zucchini length wise and Preheat oven to 350. With a spoon scrape out pulp and put it in a food processor. Add 1/4 cup Parmesan and remaining ingredients. Process until smith. Spray and glass dish and put in zucchini skins. Even fill the skins with the mixture. Sprinkle with remaining Parmesan. Bake for 30 minutes. This recipe turned out ok. My boyfriend liked it, I didn't care for it. I may try it again using some meat, mushrooms and tomato paste/sauce. So I would wait for version 2! Directions: Preheat oven to 400.Mix all Ingredients except for salmon, in a small bowl. Line a cookie sheet (that has raised edges) with foil. Brush half the sauce on the fish and bake skin side up for 18 minutes. Flip Over the salmon, cover with remaining sauce and broil for 3 minutes. Serve and enjoy!